Machined, heat-treated steel safety selector puts oversized levers on both sides of the receiver for easy ambidextrous operation. Large surface area lets you operate the safety while wearing gloves, and eliminates fumbling in the dark. Pads are deeply grooved for an ultra-secure grip under stress or when hand is wet. Can be customized by positioning the larger pad on either side of the receiver, or by applying high-visibility paint. Mounting hardware included. Individual Safety Selector Levers are available for customization. SPECS: 12L14 steel, Parkerized, black or flat dark earth. Includes Torx® screws and L-key wrench. I installed this lever in my new frontier polymer lower. The fit was a little tight but it was due to the lower. The lever is great smooth and durable. You can configure the levers on either side... Ur choice. My only complaint is that the full auto version in not available In FDE. I cannot recommend these safety selectors enough. They are perfect in fit, finish and function. I find the FDE color to be near a dead match for the Magpul FDE pistol grips. See my attached pictures. The other colors and models are equally good. Try one and you will never look back. Regarding the previous reviewer with the problematic unit. It's important to note that the cerakote will add thickness to the safety. This can be an issue on receivers who's hole is at minimum spec or undersized. As for the color I have never seen one that was not near perfect. I suggest contacting the manufacturer they will replace the levers without hesitation.They have the best customer service in the industry. They answer all emails. Installed this safety on a SI Defence 308 lower. Love this safety runs flawless. Love the fact that I can run it with my thumb and trigger finger. As far as color I thought it matched my FDE PRS stock very well. And my PRI hand guard. Great safety !!! Used this in a Cross Machine Tool UHP15 lower & it fits & works Great! I really Like the short throw very nice when shooting from the bench or CQB training. Will add to the rest of my lowers soon! TLDR: I've got 4 of these safeties on various rifles and they are great. I highly recommend them. I have a NY compliant rifle and the way the grip is makes a 90 degree safety uncomfortable to use. This selector is much easier and more comfortable to use. It also takes interchangeable levers, which make ambidextrous use more comfortable as well. Regular sized levers on the "ambi" side of rifles tend to dig into my hand. With this, you get a short lever or mount it at a 180 offset and you're good to go. I have a friend who told me about these and uses one himself and loves them, though at first I wasn't completely sold, it looks nice but the price is about equal to other ambi selectors out there so I figured, why switch? Well, then I actually tried it... WOW...It is so crisp and fast I started replacing all my ARs with this. It's one of those things that looks great but works even better than I could expect. The movement is smooth and crisp, and with the different level sizes (short, long and thin) I tried a few variations to get the exact setup that felt perfect for the way I shoot. I'm very pleased with this product and I'll be looking for more updates from Battle Arms to come. I ordered this with two standard and one flat. Standard and flat are the best ones! I love it!!! Its greatly improves the look of your rifle guaranteed!!! Very nice product that both looks good and is easy to install. The stainless steel safety detent really smooths out the selector. It was on Backorder when I placed my order, so I didn't get a choice of what levers I got (if that is even an option). It came with the standard and the short levers. I would have picked the standard and the hybrid or the standard and short-thin. Depending on your grip the lever will make contact with your hand. I purchased this product for my M-4. The safety works great. You can custom fit the safety with the levers included. 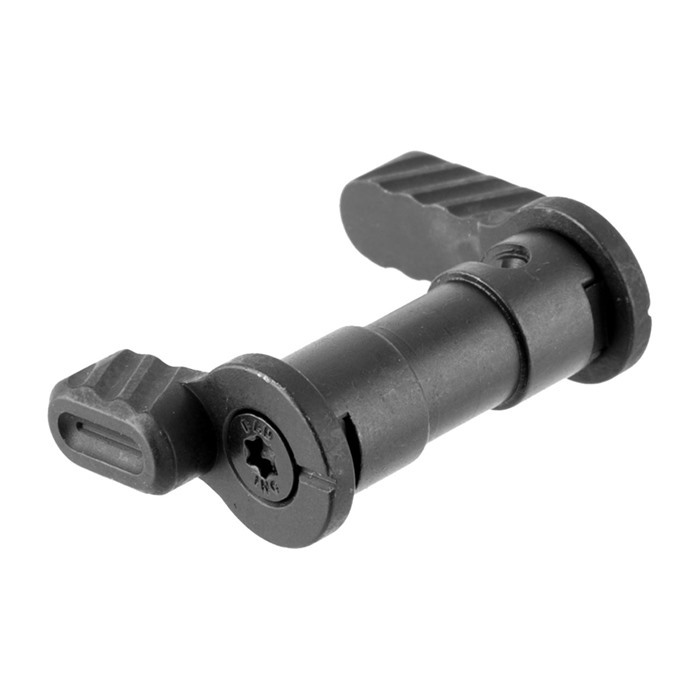 If you own or shoot an AR or M-4 you will be satisfied with the safety lever. I recieved my Awesomely abbreviated ambidextrous safety selector a few days ago and immediately installed it. Wow. The assembly could not be easier, and the wide variety of different levers available from Battle Arms Development allows for a great deal of customization. My only gripe is actually with the limited selection of these on Brownell's site. This is my second purchase of this lever. If you own an AR you owe it to yourself to try this product. I installed the lever in about five minutes. This is one of the best items that I have put on my AR. Also Roger with Battle Arms is a great person to deal with. A first class guy all the way. Keep up the good work Roger. I have installed 3 of these on my rifles! The best feature in my opinion is the "short lever" included with kit. The short lever helps keep selector away from trigger finger while still offering enough lever to safely operate ambidextrously. Levers stick out a little more than others, but makes selector easier to find under stressfull situations. Phenomenal product made by people that pay close attention to strict details. Installed in less than 5 minutes, does not require a gun smith. It's pricey, but that's the cost of excellence. Mix and match throw levers (I even inverted the throw lever on my trigger side). This product is built to last longer than the life of your rifle. I own the standard selector for my AR15 and the 45 degree short-throw for my 308AR. Outstanding and well made product. 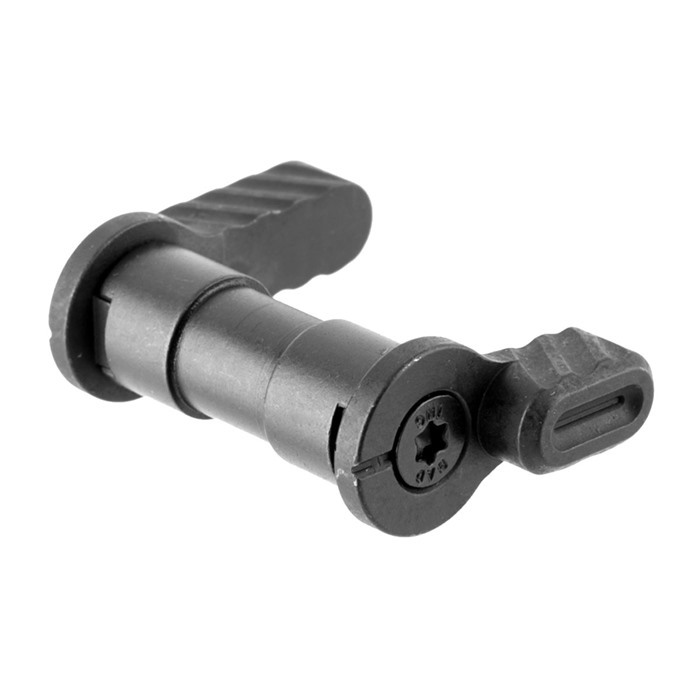 The BAD Ambi Safety Selector belongs on every compatible weapon as standard equipment. Never before have I thought about a selector lever as a "performance item," but I sure do now. This is very, very well made, both in materials, CNC cutting, and looks. Having shot this ALOT (more than a year now), I'm impressed. The quality of the parts, the machining, the fitment and finish - all first class. As far as operation, the center section is very nicely machined, and functions with an easy "flick," both to Safe and Fire - smooth. The way the center section is made gives the levers a little bit of "standoff" from the receiver surface, which will definitely eliminate any possibilities of the lever dragging against the receiver at all - I've seen this happen on some of my builds, with cheap, run-of-the-mill selectors. Mild clearancing always helps, if it's a problem. Not gonna happen with the Battle Arms Development setup. This is just a really, really well made piece of hardware - not something you'd usually put much thought into, until you try one of these beauties. Buy with confidence. I checked out and tried all of the Ambi Semi Auto A15/A10 selectors and nothing came even close. Had a question about parts and within a hour I had someone from BAD emailing me response. Buy their products, you can't go wrong. The ambi-selector is an extremely well-developed product. Easy to install, it goes on in under 5 minutes. Once installed, the functionality is completely apparent. Bringing your rifle back to safe becomes much easier. If you need to fire opposite-hand, your controls are where they need to be. Excellent work by Battle Arms Development on this selector! This selector is smooth, and looks cool too. I've tried other ambi selectors over the years but none of them are close to the workmanship and design found on the Battle Arms Development's selector. I have them on all 3 of my AR's now. The other thing you will find is Battle Arms customer service is second to none. Installation was extremely easy and the selectors function flawlessly. If you are considering an ambi selector look no further. For a lefty, this is a must have item. very smooth feel and love the interchangeable levers. I ordered a set of Ambi selectors and they are awesome. Install went smooth and the new KNS stainless detent made a huge difference from the factory detent. Their service is one of the best I have ever dealt with. Ive had a few questions and sent Battle Arms some Emails and all of my emails have been responded to almost instantly. installed on 3-AR15s and 1 AR10 it took less than 15 minutes total to remove old selectors and install/safety check these.obviously smoother than factory and very positive lock-up.went to the range and tested them and no hick-ups. This is an exceptionally well manufactured product. Immediately I could tell this part was truly an enhancement/replacement of the existing factory ambi selector. The material used is part of the reason. However, moreso than that is the well thought out assembly of the component into existing lower receivers. When installed correctly this multi-piece component will not come apart or fail to work. I highly recommend Loctite when final tightening and assembly is being done. Given the available configurations of different levers, anyone wanting an ambi selector that is just right for them, should definitely consider this upgrade to their AR15 weapons platform. Great, positive engagement. Installed in 10 minutes. Haven't used any loctite yet but it shows no signs of coming loose and I messed with it all afternoon. I like the little bit of added width as well. Note one thing though, if you use an extended rear takedown pin it could interfere with safety manipulation depending on how you engage it. I use my right index finger to put it on safe so I never have any issues with it. Makes your AR truly functional especially if your strong arm is out of play. Just installed another one of these. Awesome, well engineered and thought out. I wouldn't run another safety. Not to mention the price. 5 stars! By far, this selector has been the best investment I've made while buying parts to outfit my carbines. I have 3 now, all short throw selector cores, to go with my Geissele triggers. Customer service for Battle Arms is top notch, the product is fantastic, and there are a lot of options to choose from. The fact is, even if you don't want an ambidextrous selector lever, upgrading to one of these units adds a great, positive feel to selector position, whether it is on fire or safe. 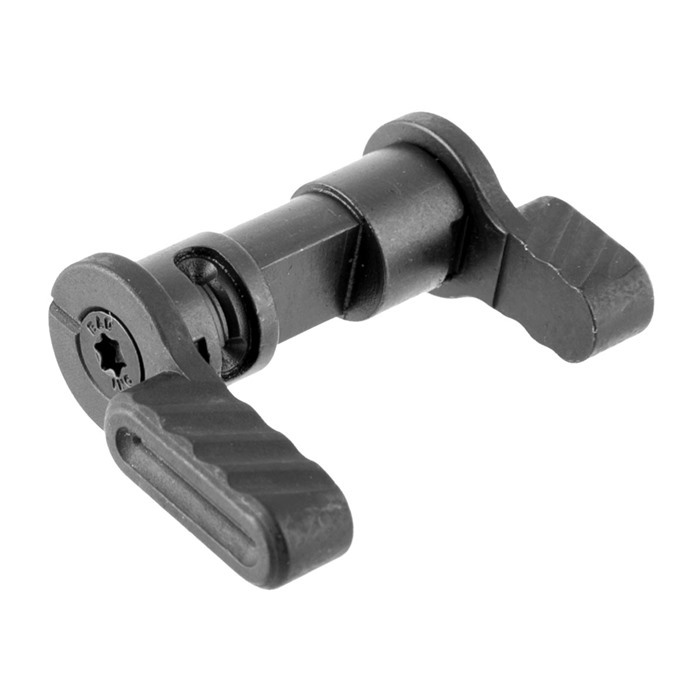 Along with the many various kinds of lever options, there is an endcap that makes it function as a standard, single sided safety selector, except with far smoother and more positive feedback to the user. 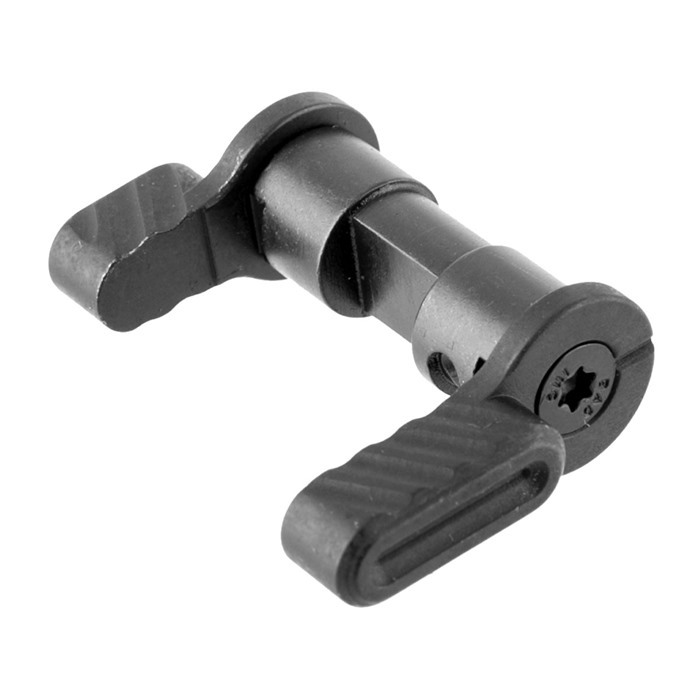 The greatest thing about these selectors is that regardless of where you buy it from, be it the manufacturer's website, Brownells, a local retailer, or somewhere else on the internet, Battle Arms will send you free replacement levers if you ever decide to try a different combination. You literally can't lose by buying this product. Any rifle can benefit from this upgrade, and once you feel how much more positive the positioning is on a Battle Arms selector, you won't want to go back to your old milspec unit. I now own 3 of these. I have one on my Colt AR15, one on my LR-308, and one on my Mega AR15. I own both the regular and the short throw units, all in a variety of colors. I even give them out as gifts to my family. You couldn't ask for a better product, or a better company to buy from. easy to install, excellent machining, great product. i have 4. Very high quality, easy to install, precision feel of snicking safety off & on, can pick different levers on each side to set up exactly the way you want. Easy to install, positive click felt when safety applied on & off. A great product well worth the money. Very satisfied and will buy it again. This is a must have for all AR owners. Great workmanship, will last forever and service is second to none. I have this safety installed on all of my AR style rifles (5.56 to 7.62). The ability to engage the safety with the trigger finger without the lever being obtrusive is a near mandatory upgrade for any serious AR shooter, whether professional or recreational. Bought the Troy Ambi Safety, because this one was out of stock. I gave it a five, but after installing this one I would givethe BAD- a ten! Easy to install, rock solid, and smoother than the O.E. safety. Look no futher, just get this one. I installed this on my police patrol rifle. I have four "lefties" on our Patrol Rifle Squad. So I installed this safety to test it for my squad members. It installs exactly like a mil-spec safety except it can be installed with the longer lever on either side for left or right operators. Perhaps the best feature is I can "feel" the condition of the safety under my trigger finger in the "master-grip" position. This is perhaps the best feature of the safety. I was very impressed with how easy it installed. No wiggle. No fuss. I can't be any happier. I thought about getting a rock river ambi but I'm glad I bought this ambi instead. I plan on purchasing a shorty lever for my left side as well. Very easy to install, I have a Jard trigger previously installed. Installation required adjusting allen bolt for the safety, it was easily done though. The "standard" short off-hand short "thick" safety was bothersome. I installed the short "thin" safety for off-hand use. Main trigger finger is much happier with the "thin" version. Off-hand safety provides tactile feel of safety position with trigger finger. I will purchase more of these. This ambi-selector fits and works as expected. I can now set/reset the safety without rolling the rifle over. Removal of the old selector is easy. Just pull the hammer back to the full back position, rotate the selector and it comes right out. On my rifle, I had to back-off a trigger adjustment set-screw 1/2 turn, which is located adjacent to the handle attachment screw hole. The new ambi-selector went right in. 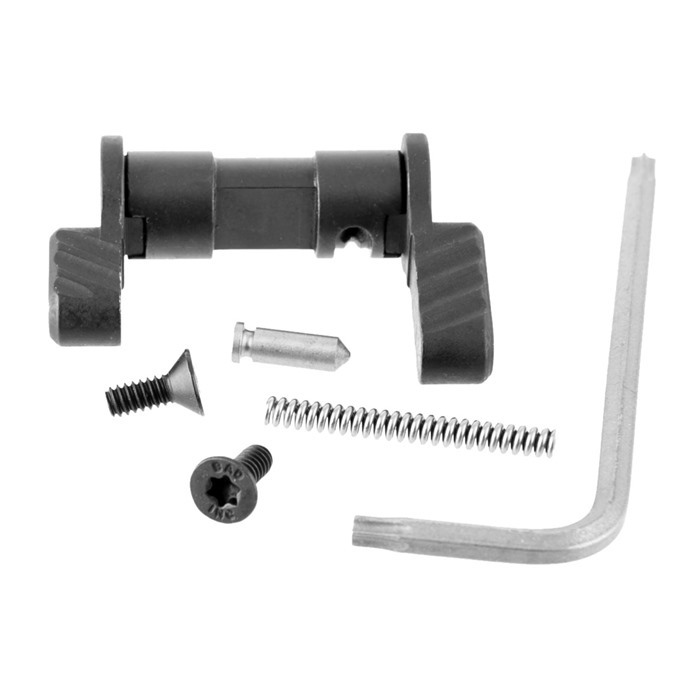 The detent post & spring holds the selector centered and provide proper break and tension. The only observation that I have is that, on my rifle, there is about 0.020 more clearance between the levers and the lower on each side than needed although this is minor and not a problem. I'd recommend this to everybody not just us lefties. I had purchased a different manufacturers selector first, but for a couple of reasons it did not function well. So online to Brownell's and purchased the BAD Ambi Safety Selector. As normal the part was on the door in a couple of days. I quick review of the instructions and installed in just a couple of minutes, worked perfectly and has ever since. Buy the Battle Arms the first time. I now have 3 rifles with them installed. I purchased a half dozen Battle Arms safety selectors last year at this time and only just recently installed one of the few unused ones and discovered that it was defective. I e-mailed Roger, the owner of BAD and was immediately given a phone number to call to address my issue. Speaking with Roger was very enlightening and he gave me several possible fixes for my issue. None of them worked and in less than a week I had a new center that Roger hand selected himself in my hands. The new center works like a charm, very positive click, and smooth operation. Deal with Roger and Battle Arms Development with the utmost confidence. It is the best gear on the market, they are always creating new innovative products, and if you have any problems, the owner will speak to you personally and professionally to fix them. I'm a customer for life! this safty is the best upgrade yet for my ar. easy to install, works smooth and looks cool to boot. if i owned 25 ar rifles this ambi would be on all of them. I've been using BAD ambi safety selector for about 6 months now on my 10.5" SBR. They are now on all MY ARs. I use the crank on the left and short on the right. I originally had the standard on the right but it was so long it rubbed my trigger finger with recoil. The short is more than enough. The crank on the primary side is truly revolutionary. It's smooth, very easy to engage with or w/o gloves and while wet/snowy. I've got all my buddies hooked on the BAD ambi safety selector. Machining is great, installation was a breeze. Customer Service is on par with the best of the best in the firearms biz. There's a large following on ar15.com - check out their industry section. Duffy is the man! Shipping directly to and from BAD is insanely fast and email communication is answered in minutes, even after hours. Can't wait to try BAD's 45* selector. I have looked at and tried several different Ambidextrous Safeties, read tons of reviews, (mostly all were in favor of the Battle Arms Developement Ambi Safty)and concluded that this was the one for me. The very most important thing to me was the Customer Service that I received after the purchase as I wanted to exchange one of the selectors for a different one and found that there would be no charge at all and I was very pleased by the immediate response from BATTLE ARMS DEVELOPEMENT. The quality is great!! This is a quality product. It installs quickly and easily, and functions smoothly and positively. For right-handers who prefer to switch to "safe" with their trigger finger, this is a great option. I have them on all my personal AR's and on all my builds. Love the feel, functionality and looks. Dealing with Roger at Battle Arms was a pleasure too. I would personally recommend this selector switch. These guys get shipping out literally in hours. I've purchased five times from BAD and every time the package has shipped in hours. Not only that, their products are top notch. I have their ETP/EPP, and their ambi safety. Both are the only ones I will put on my AR's. I cannot recommend them enough, you will not be disappointed! The Battle Arms Selector is one of the best mods you could do on your AR's, cosmetically and functional. The best thig about it is that you could chose between the short and long selector, and its well constructed. I will be buying this product again for future build's and recommending to other gun builders. The best of all this is how FAST it was shipping!!! Brownells keep up the good work and i will always come to you guys for my firearms need's! Nice when something works the way it should. Simple to install (better instructions and more clear images would be nice) and works perfectly. Very crisp transition from safe to fire. The old safety was like mush in comparison. A must for any left handed (only ones in their right minds) shooter. Fits well in my Mega MATEN. It comes with a detent and spring so you don't have to buy them separately. You can switch the levers to put the long one on either side. One of the best changes to my AR yet. Being a right handed shooter, I can use my right index finger to put the rifle on safe, without loosening my grip. Easy installation, and there have been no issues. I originally thought the short fat lever might interfere with my grip, and went to the short thin lever, but that didn't give me enough purchase to operate reliably, so I switched back, and have been happy. Also a great mod for support hand shooting. Got two of these for Colt Le6940 and Colt Le901-16s. They both went in easy by just obviously removing Pistol grip. Selects in both directions smoothly on both guns. Safety selector is cool. Definitely fits the persona of the gun I was building. Good fitment between the 3 parts of the selector, no play in the knobs against the cylinder. Frustrated with the fact that it was between .0625" and .125" wider than the lower receiver of the gun. After installing and operating the selector, you will notice daylight between receiver and selector knobs on both sides. However,it appeared to be more of the left hand side that was not fit, than the right. If you are going to get this, spend the time to file down the ends of the safety mechanism cylinder to fit properly. Installed easy with included torx screws and wrench. Be sure to add a little non-permanent thread locker before tightening. Improved function of safety for me. I now use index finger to engage safety and thumb to disengage safety. I like this safety so much I bought another one for my other AR. Engage with my index finger, disengage with my thumb. Best safety lever on the market in my opinion. As you can tell from the other 50-odd 5-star reviews, the basic B.A.D.A.S.S. (actual acronym) is pretty great, but the wide paddles admittedly aren't the best for trigger finger clearance, especially shooting left-handed. HOWEVER, each of these can be swapped out with the turn of a screw for any of several additional designs from B.A.D., and between them you're bound to find a combination that works for you. (I personally recommend the Hybrid models, and I'll be giving them their five stars next.) Definitely worth the investment. I had purchased this item for a customers build and after installing and operating the lever, I knew I needed one for my own custom AR-15. Being that the billet lowers were not "mil-spec" there was the problem of having a longer safety axle than the original safety had. This required me to put this new safety axle in the milling machine and machine it to fit the billet lower. I read in a review by Schuneman85 that he had a similar issue. I don't believe it was the safety lever being out of spec but the use of a non "mil-spec" reciever. So, after milling approximately .055 in. off of the axle I was able to install the safety, also the long lever had to be relieved .030 in. also to clear the pistol grip. It only took an extra 30 min. to fit it to the lower and it was worth it, as the feel and looks are outstanding. I feel this is one upgrade that is well worth the price paid, even if you have to fit it to the lower. The parts are all very good quality as the machined very well, very clean. If you want your selector to go *SNAP* when employed, DON'T BUY THIS. I have three of these installed and two more in a box. I do not understand the great ratings. I installed one in a Noveske lower a couple of years ago, and now it has little resistance and can easily be accidentally turned simply by brushing against it. So, I though maybe I just got a bad BAD selector, because of all the great ratings. So, I bought FOUR more (not from Brownells) just to compound my error. I installed two in brand new lowers...the result is terrible. At first they were completely unusable and difficult to flip at all. After hours of just flipping them to break them in they are still terrible and have NO DETENT that I can feel. So, I took a close look at the core. Compared to a standard safety the detent holes are very shallow and narrow, which means that if the spring is not extra strong and the detent narrow you will not feel the detent and it will not stay in place. I'm not sure what to do at this point, I think I'm going to contact BAD, and send the two unused levers back to where I bought them from. This shouldn't be rocket science; The basic selector design has been around for half a century or more. I have been shooting ARs a lot for the last 10 years and I've built nine ARs and helped friends build theirs. These selectors are useless to me now and at almost $60 a piece these are a totally wasted investment. I'm going to try increasing the spring pressure and maybe modifying the detents with a diamond dremel to see if I can get any improvement in feel. Sorry, but I've got to tell the truth about this product. I would have given it ONE STAR, but they look nice so I gave it two. Don't waste your money, fits loosely and over hangs. not the precsion I expect for the money. Does not snap from safe to off safe or back. Unless pushed it stops wherever you let off. This seems to be common. I heard there is a new generation thatâs better. The newer one I messed with felt great but mine feels terrible. Several guys in my class had the same complaint as me. To begin I'd say the overall design is very nice. The shape of the levers and the ability to swap the side of the large or small is certainly a plus. Installation is easy and I've had no issues with it working with both GI and Geissele triggers. I will say on my version the safety didn't so much snap into place as slide into place without a very positive click. Mine are a few years old so maybe the design has improved or there is some sort of tolerance issue with my Spike's receiver. Unfortunately, I've had two fail now, with the latest today. It's the same failure both times. The screw on the right hand side snaps right below the head. Yes you get replacement screws, but you're left with the screw shaft in the cylinder and you'll need an easy out to remove it. I really don't believe I'm over torquing these screws. I'm getting them flush and then applying one more lose twist on the torque driver, just to seat the screw. I've only ever had this issue before with cheap fasteners, and never with any other firearms screws. Both times the screws had only been reinstalled once. Brownells replaced the first thanks to their forever guarantee. Have to contact CS again (it's not Brownell's fault). Číslo výrobce: BADASS 798681569144 Masivní, tepelně zpracované ocelové bezpečnostní volič vloží nadměrné páky na obou stranách přijímače pro snadné oboustranné ovládání. Velké plochy umožňuje provozovat bezpečnost při nošení rukavic a eliminuje tápání ve tmě. Polštářky jsou hluboce drážkami pro mimořádně bezpečné uchopení ve stresu nebo když ruka je mokré. Lze přizpůsobit umístění větší podložky na obou stranách přijímače, nebo použitím reflexní barvy. Montážní příslušenství součástí balení. Jednotlivé páky voliče bezpečnost jsou dostupné pro přizpůsobení. Číslo výrobce: BADASSFDE Masivní, tepelně zpracované ocelové bezpečnostní volič vloží nadměrné páky na obou stranách přijímače pro snadné oboustranné ovládání. Velké plochy umožňuje provozovat bezpečnost při nošení rukavic a eliminuje tápání ve tmě. Polštářky jsou hluboce drážkami pro mimořádně bezpečné uchopení ve stresu nebo když ruka je mokré. Lze přizpůsobit umístění větší podložky na obou stranách přijímače, nebo použitím reflexní barvy. Montážní příslušenství součástí balení. Jednotlivé páky voliče bezpečnost jsou dostupné pro přizpůsobení. Číslo výrobce: BADASSSSL Masivní, tepelně zpracované ocelové bezpečnostní volič vloží nadměrné páky na obou stranách přijímače pro snadné oboustranné ovládání. Velké plochy umožňuje provozovat bezpečnost při nošení rukavic a eliminuje tápání ve tmě. Polštářky jsou hluboce drážkami pro mimořádně bezpečné uchopení ve stresu nebo když ruka je mokré. Lze přizpůsobit umístění větší podložky na obou stranách přijímače, nebo použitím reflexní barvy. Montážní příslušenství součástí balení. Jednotlivé páky voliče bezpečnost jsou dostupné pro přizpůsobení. Číslo výrobce: BADASSSWR Masivní, tepelně zpracované ocelové bezpečnostní volič vloží nadměrné páky na obou stranách přijímače pro snadné oboustranné ovládání. Velké plochy umožňuje provozovat bezpečnost při nošení rukavic a eliminuje tápání ve tmě. Polštářky jsou hluboce drážkami pro mimořádně bezpečné uchopení ve stresu nebo když ruka je mokré. Lze přizpůsobit umístění větší podložky na obou stranách přijímače, nebo použitím reflexní barvy. Montážní příslušenství součástí balení. Jednotlivé páky voliče bezpečnost jsou dostupné pro přizpůsobení. Číslo výrobce: BADASSBLU Masivní, tepelně zpracované ocelové bezpečnostní volič vloží nadměrné páky na obou stranách přijímače pro snadné oboustranné ovládání. Velké plochy umožňuje provozovat bezpečnost při nošení rukavic a eliminuje tápání ve tmě. Polštářky jsou hluboce drážkami pro mimořádně bezpečné uchopení ve stresu nebo když ruka je mokré. Lze přizpůsobit umístění větší podložky na obou stranách přijímače, nebo použitím reflexní barvy. Montážní příslušenství součástí balení. Jednotlivé páky voliče bezpečnost jsou dostupné pro přizpůsobení. Číslo výrobce: BADASSSIGPINK Masivní, tepelně zpracované ocelové bezpečnostní volič vloží nadměrné páky na obou stranách přijímače pro snadné oboustranné ovládání. Velké plochy umožňuje provozovat bezpečnost při nošení rukavic a eliminuje tápání ve tmě. Polštářky jsou hluboce drážkami pro mimořádně bezpečné uchopení ve stresu nebo když ruka je mokré. Lze přizpůsobit umístění větší podložky na obou stranách přijímače, nebo použitím reflexní barvy. Montážní příslušenství součástí balení. Jednotlivé páky voliče bezpečnost jsou dostupné pro přizpůsobení. Číslo výrobce: BADASSGMG Masivní, tepelně zpracované ocelové bezpečnostní volič vloží nadměrné páky na obou stranách přijímače pro snadné oboustranné ovládání. Velké plochy umožňuje provozovat bezpečnost při nošení rukavic a eliminuje tápání ve tmě. Polštářky jsou hluboce drážkami pro mimořádně bezpečné uchopení ve stresu nebo když ruka je mokré. Lze přizpůsobit umístění větší podložky na obou stranách přijímače, nebo použitím reflexní barvy. Montážní příslušenství součástí balení. Jednotlivé páky voliče bezpečnost jsou dostupné pro přizpůsobení. XTM Enhanced Rail Panel Picatinny Polymer Dark Earth 1.5"